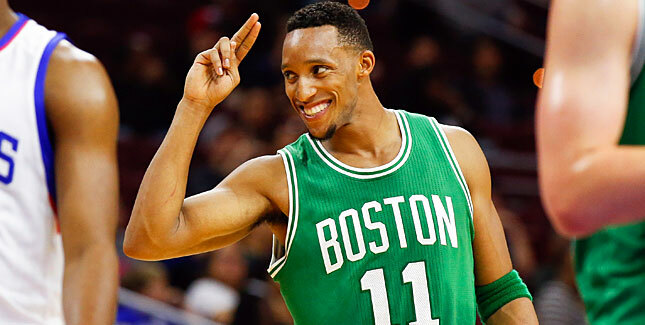 Last year, Evan Turner started 57 games for Boston. Turner has started just eight games this season. The lack of playing time hasn’t stopped him from being a key piece to this team. Next year Turner is a free agent and if the Celtics let him go to another team, they would be crazy. At the beginning of the year he knew he was taking a backseat to Jae Crowder, who proved himself to be a starter in this league. Turner didn’t have a great start to the season averaging 43 percent from the field, and 14 percent from three-point range in the month of November. He was averaging nine points, five rebounds and 4 assists in that month as well. In December was much better for Turner, as his stats improved in almost every category. January was very up-and-down for Turner, as he was very streaky. Once the Celtics started their winning streak, Turner never looked back. The past two months he has averaged 12 points, six rebounds and five assists at 47 percent shooting from the floor. The most astounding stat that has sky-rocketed was his percentage from three, averaging about 50 percent. Turner’s recent play has him in the running to win the Sixth Man of the Year award. Though his stats may not seem impressive, the intangibles he brings to the court each night, are very valuable. It’s look at his stats to define the type of game he plays or what he does for a team. Whether its him making a crazy pass, hitting a shot in someone’s face or cutting through the defense to make a contested layup, he is always doing something to make you think how he did it. The most valuable thing about Turner though, is his play in the fourth quarter. When it’s a close game, the ball better be in his hands because he is going to make something happen for sure. He has had a couple games this year where he made big plays to help his team win or come close to winning. Turner’s most notable game this season came against the Philadelphia 76ers on November 25. Turner dished a pass to Crowder, who drained the three to put them in the lead. Another example is when he forced his way to the rim, was able to draw contact, make the layup, and also made the clutch free throw against the Los Angeles Clippers to put them up by three in overtime. The Celtics have a few players they can rely on in situations like those, but Turner has made himself stand out. Looking at his situation for next year, the Celtics need to bring him back. Turner is definitely having some of his best years playing for Boston. After his time in Philadelphia, not living up to the high expectations and in Indiana, it seems like the Celtics are a perfect fit for him. One team that the Celtics have to worry about are the New York Knicks wanting to sign him. However, the Celtics have come out and said that they would like to have Turner back next year. So unless something bad happens between him and the organization, expect to see Evan Turner wearing green for years to come.